Welcome Week is designed to give all our students the opportunity to engage with College and university life. It is an exciting time as students move in and establish friendships that will last a lifetime. By the end of the week students can expect to have a good understanding of College policies, procedures and support structures within the College and university that can assist with any issue or concern during a student’s stay with us. During Leadership Week (December 2018), all students leaders undertook training with Leading Teams to develop their vision for the week. They have since worked hard over summer to ensure a program full of events, workshops and also time to explore university with the support of mentors and academic tutors. 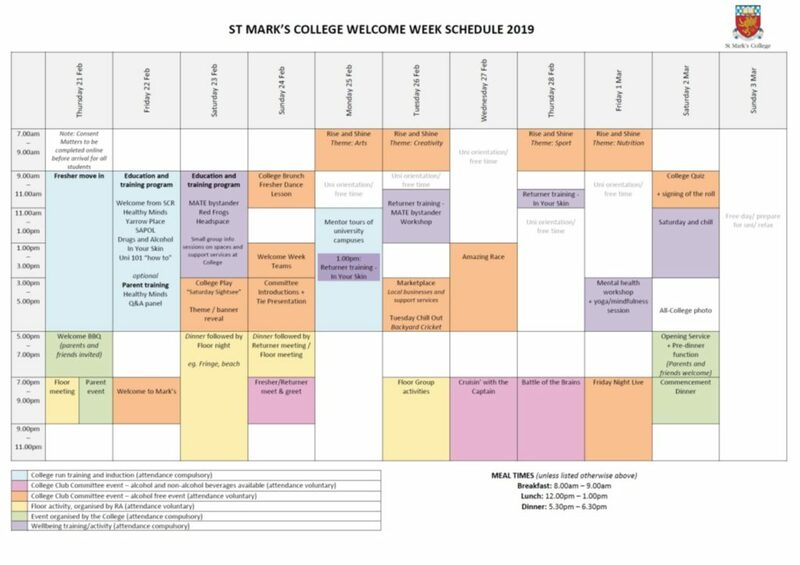 The Welcome Week program incorporates leading practice in training and education and has been tailored to the needs of new students who are commencing College and University for the first time. We have endeavoured to encompass sessions and activities that cover all aspects of College life, taking into account that each university runs specific orientation sessions for new students which cover everything from course enrolment through to how the counselling services work. There are many exciting events and workshops throughout the week, with a full schedule available here. Stay connected with us on Facebook or Instagram to see all the excitement and energy that is Welcome Week 2019.